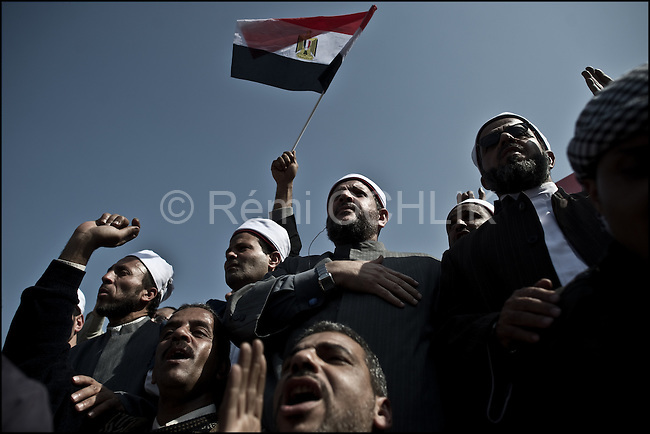 © Remi OCHLIK/IP3 - Cairo Feb. 01 -- Tahrir square - Men from muslim brotherhood organization protest during the Egypt's "million man march".. Whether they achieved that targeted head count is unclear, but their message was unequivocal. "Mubarak get out!" protesters chanted. Tuesday's rally in downtown Cairo was the largest anti-government demonstration in modern Egyptian history, drawing the full spectrum of Egyptian society. Wave after wave of men, women and children poured into the central square from morning until well after the government's 3pm curfew...It was the eighth consecutive day of protests calling for Egyptian President Hosni Mubarak to step down. Earlier this week the 83-year-old dictator, who has ruled Egypt for 30 years, appointed a vice-president and changed his cabinet to appease the public's growing anger. Protesters say he has missed the point entirely.